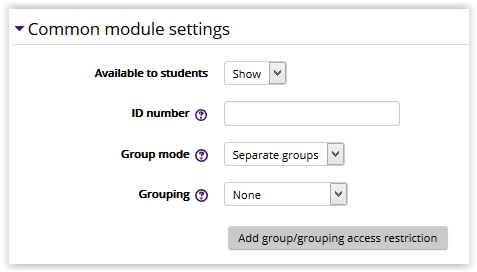 The Kaltura plugin for Moodle adds several features that enable instructors to add and manage video and audio content in their Moodle courses. For instructions on adding a video, see Kaltura: Adding a Kaltura Video Resource. In the General settings, the instructor can designate a title and provide a description of the video. The Video settings allows the instructor to add the media. For more information, see Kaltura: Adding a Kaltura Video Resource. These settings specify the visibility of the video for students (Hide/Show), and the group mode and grouping can be designated (not necessary for this resource). The video's access can be restricted based upon a date, group, activity completion of another activity/resource in the course, etc. NOTE: If more than one restriction is added, students must meet EACH of the requirements before the video becomes available. By default, students can manually mark the assignment as complete. The instructor's only options here are to either allow students to mark the activity as complete, or to not track completion at all. If an instructor wants to view the analytics of the video (to see which students have watched it), visit Kaltura: Managing Your Videos.